A native of Rhinebeck, NY, Dr. Williams grew up on a small horse farm, and was active in 4-H and local horse shows in his youth. He attended Cornell University in Ithaca, NY, where he received his B.S. in Animal Science in 1976, M.S. in Animal Nutrition in 1978 and his D.V.M. in 1982. After graduation, Dr. Williams went to work for Dr. Richard Sheehan, a Massachusetts veterinarian and former president of the American Association of Equine Practitioners (AAEP). The practice specialized in racetrack work and lameness clinics. 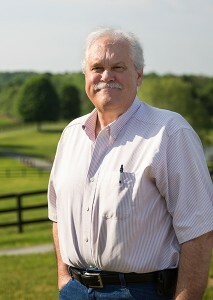 Dr. Jeffrey A. Williams joined Drs. Miller, Mountan & Mort in 1983 and became a partner in 1985. Dr. Williams is a member of the AAEP and the New York State Veterinary Medical Society and has written a chapter in the current reference book, “Diagnosis and Management of Lameness in the Horse”. His special interests include lameness exams, equine sports medicine, and reproduction. In his spare time, he plays guitar and enjoys spending time with his family.